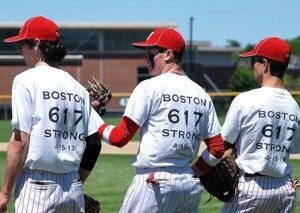 Hudson High School varsity baseball team players sport the T-shirts they sold to benefit the One Fund Boston. Hudson – The annual Memorial Day baseball rivalry pitting Hudson High School (HHS) against Marlborough High School has produced countless memories for several decades. This year&apos;s game, played May 27 at Riverside Park in Hudson, will be remembered as the culmination of a month-long fundraiser organized by the HHS players to benefit the One Fund Boston. The team&apos;s coach, Tim Reinhardt, a social studies teacher, was aware that the players wanted to do more community service. The players have regularly manned the Snack Shed for Hudson Youth Baseball and Softball. Following April school vacation, the players extended their attention to victims of the Boston Marathon bombings. The front of the T-shirt states “Hudson Baseball.” Emblazoned on the back is “Boston Strong.” Bobby Rhodes, a junior, volunteered to manage the T-shirt sales. “I offered because I felt the coach has enough to deal with and it&apos;s a good cause,” he said. The amount of sales surprised Patrick Cadden, a junior, one of the team&apos;s five captains. “We raised a lot more than we thought we would,” he noted. Steve Rivera, also a junior and a captain, welcomed the opportunity to do more community service. On game day, the team reached out to the Hudson community. They presented a pre-game ceremony featuring six of the town&apos;s first responders, each of whom are HHS alum and played baseball while students. The honor of throwing the first pitch went to Officer Jesse Hayden, who graduated from HHS in 1999, a year the baseball team achieved state champion. Hayden works with a SWAT team based in Worcester County. Following the marathon bombings, he was among the first responders in Boston and Watertown. He commended the varsity team&apos;s fundraising efforts and the invitation for local first responders to participate. His brother, Ross, works part-time for both the police and fire departments, and participated in the ceremony. 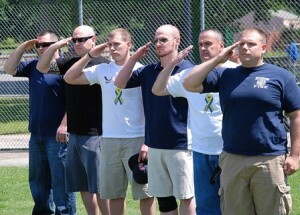 Other police officers taking part were Zac Attaway, Joe Kerrigan and Shamus Veo, with firefighter Marc Exarhopoulos. Additional donations were added to the T-shirt sales. Avidia Bank contributed $500. The company that created the T-shirts, Corporate Casuals, gave $100. Michael Mercuri, HHS basketball coach, raffled his Bruins tickets, which raised $160 toward the fund. Special education teacher Janet Fujita donated $100. A 50/50 raffle at the game raised $210. Someday, it might be forgotten that HHS lost this year&apos;s Memorial Day game 10-7 in 13 innings. Among the better memories will be that the players” teamwork raised $3,316 for the One Fund Boston. Saluting as the National Anthem is played are representatives from the Hudson Police and Fire Departments, each a Hudson High School alum: (l to r) Ross Hayden, 2007; Jesse Hayden, 1999; Zac Attaway, 2001; Shamus Veo, 2001; Joe Kerrigan, 1986; and Marc Exarhopoulos, 2002. 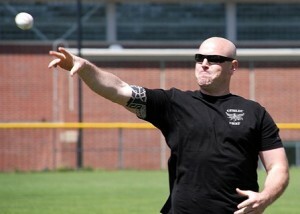 Officer Jesse Hayden throws the first pitch.